If you’re reading this, well, you know the last-letter drill. You made it. I didn’t. Get off the guilt train, because I know if there was any chance you could have saved me, you would have. The Last Letter by Rebecca Yarros is as much a heartbreaking as it is heartwarming contemporary romance. 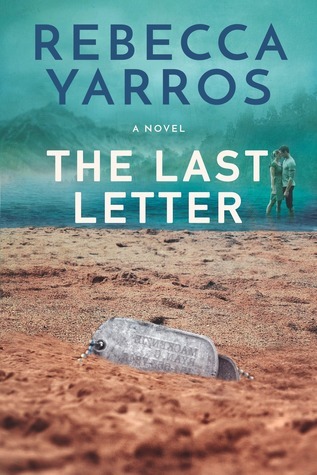 For anyone not familiar what the title, The Last Letter, is referring to the book is about a soldier who was killed in duty leaving a letter to be read after his death. Beckett and Ryan were best friends serving together in the military with both men not having much in the way of family. Ryan did have his sister back home though and seeing Beckett with no one to communicate with he set up Ella and Beckett as pen pals. When Ryan was killed in active duty he left his last letter to his best friend asking him to take care of Ella. Ella is a single mother to twins, a boy and a girl that she lives her life for and would do anything to protect. Having been left alone and pregnant and her only family left in her brother that joined the military Ella has had to fight to get where she is in life. Now Ella is also fighting for her daughter’s life when she’s diagnosed with cancer. The story in this one actually begins with briefly showing Beckett and Ryan serving and the letters to Ella beginning but then heads to Beckett’s arrival in Telluride in the present time. As the chapters begin happening in the present readers still get to read the letters written in the past between the chapters to get the backstory of how Beckett, Ryan and Ella all came to know one another. The title alone hints of this being an emotional story but even with that hint I wasn’t prepared for just how emotional it really was. Needless to say a box of tissues needs to be on hand while reading this book and each time you think the roller coaster of emotions is going to end it heads back up the hill to come crashing down yet again. I was hooked on every single page of this one and would highly recommend buckling up for the emotional ride. When she’s not writing, she’s tying hockey skates for her four sons, sneaking in guitar time, or watching brat-pack movies with her two daughters. She lives in Colorado with her husband, their rambunctious gaggle of kids, and their menagerie of pets. Having adopted their youngest daughter from the foster system, Rebecca is a passionate advocate for children through her nonprofit, One October. Want to know about Rebecca’s next release? Join her mailing list! Or check her out online at http://www.rebeccayarros.com. I had to get this one, it sounds so good! I hope you like it Jacquie! They really should send little packets of tissues along with copies of this one. Sounds like an emotional read, good review. Thanks Trisy! The heartbreaking side of it isn’t really the relationship angst but one of the children has cancer so that had me grabbing tissue after tissue. There is some trust issues and things to them too but those kids, oh my. I’m so sorry to hear that Trisy!! I can totally understand not being able to read a book that deals with it as I still to this day have problems with Alzheimer and dementia stories after watching my grandmother’s battle with it and losing her almost a decade ago. This one sounds so emotional. I have added it to my TBR, I will have to see if my library gets it once it is released, if not, then Amazon it is. Great review Carrie, thanks for the tissue warning, but based on the synopsis and your review, I don’t think I would have needed it. Thanks Carla! I knew from the title and cover to expect some sadness to it but with the kids being involved I spent a lot of time reading through tears, beautiful story overall. It doesn’t take much to get tears flowing anymore. I will make sure i am in the right frame of mind before reading this one.